A few months ago in a blog we talked about Shedquarters as a possibility for your small business – basically as a possible alternative to traditional office space. Ever heard of Sleepbox? These modular pods can be set up almost anywhere and can provide a great place to take some downtime or a nap while you are working. Sleepboxes are popping up in airports and other places as micro-capsule hotels around the world. These ‘pod hotel rooms’ are a great way to relax or sleep during long layovers or as an inexpensive way to get some rest while traveling. But more and more, cities are seeing these Sleepbox hotels as affordable alternatives to traditional hotels for business travelers and tourists. The idea of sleep pods or capsule hotels is not new. For many years, these types of accommodations have been around. In Japan, the capsules are stacked side-by-side, two units high, with steps providing access to the second-level rooms (leading to inevitable comparisons to corpse drawers in a morgue)! This is why the idea of Sleepboxes that are not as small seems more accommodating and acceptable to many people. The other problem with the Japanese pod capsule hotels was that more and more guests were renting capsules by the month because that was all they could afford. Sleepbox is one brand of pod accommodation that offers a bed and associated facilities of hotels in a limited space. It is a larger version of capsule hotels you would see in Japan, but very different in the privacy and comforts that they offer. Typically, they include a bed with fresh linen, a climate-control system, alarm clock, TV, WiFi access, desk space and electrical outlets for laptops and cellphone charging. 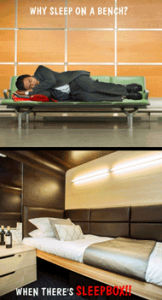 In Europe and North America, the concept of using Sleepbox in airports and train stations caught on slowly. But they have now become more popular because of the privacy they offer and the ability to use them for just an hour or two of sleep or just some rest (something that is not offered at most hotels without having to pay for an entire night). Some of the other uses for Sleepbox are when a weary employee or executive is burning the midnight oil working, and he or she is too tired to go home – or the trip home would take them too long, only to have to turn around and head back to their office space. Many small business owners know that sometimes they may enjoy a few drinks with clients or in celebrating a big job or contract, and that driving home would not be a smart idea. But the cost of a downtown hotel room is not always an option – so the simple accommodations of a Sleepbox would be a great solution. There are even some companies that are considering installing modular Sleepboxes in their office building, to provide a place for tired and weary employees to take a short nap and recharge. As we mentioned in our blog “Time To Talk Naps Again“, researchers are saying that naps can restore alertness, enhance performance and reduce mistakes and accidents. So having a Sleepbox on site might also increase productivity for your small business.